Looking for a Meeting Agenda Example? You have come to the right place! Every meeting runs differently, and it is important to have some type of guide to follow when you are developing an agenda. Here are a few examples of different meeting agendas that you can download and use as a guide when developing an agenda for your meeting. Remember to distribute the agenda to participants before the meeting. If you are struggling with creating a proper agenda, meeting management systems like MeetingBooster include a variety of meeting agenda examples such as sales meeting, board meeting, business meeting and staff meeting agenda examples. I now that there are meeting agenda examples online, however the meeting agenda examples in MeetingBooster are ready to use, and cover many types of meeting agendas. Some examples are used for general business meetings, staff meetings even sales meeting agendas. MeetingBooster also provides more task oriented agenda examples to improve accountability by including pre-meeting tasks such as, budget preparation, status updates and more. The examples can be customized for use within your organization. Typically people create their agenda in Microsoft Word, however there are alternatives. Mind Mapping software such as MindView allow you to brainstorm your agenda in a Mind map allowing you to see the agenda as a whole, and meeting systems like MeetingBooster let you create an agenda, and save it online as your own template. These meeting agenda examples can then be shared with colleagues to align meeting procedures. 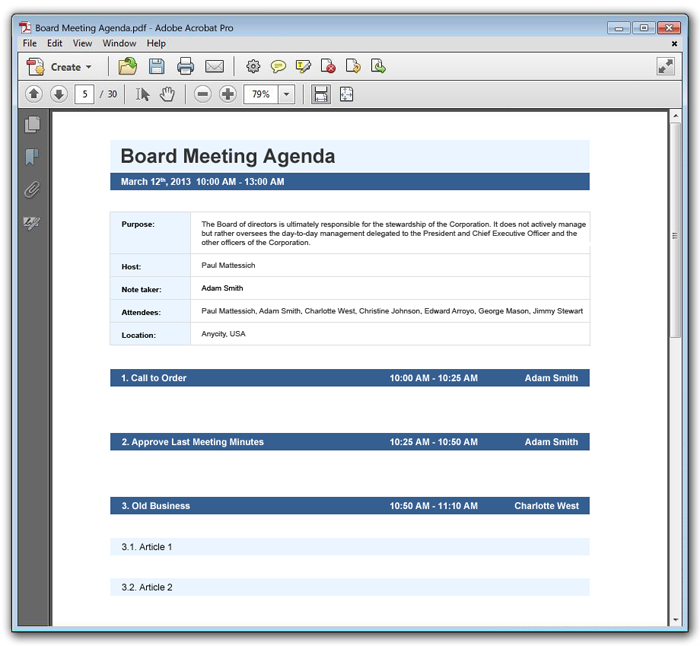 MeetingBooster allows user to access previous meeting agendas to be used the foundation for a new agenda.